ProWorkflow is a system that focuses on project visibility and control to help you collaborate seamlessly with your teams. Its features and tools are scalable to match the needs of freelancers, small, medium-sized, and large enterprises. The Homepage Dashboard gives a quick overview of your current status for active, finished, and future work. You can also keep everyone updated with the Messaging Tool. Attach files, choose whether to make them private or public, and send them. The tool also features one-click replies. Likewise, the easy-to-use Gantt Style Timeline lets you see a global view of your projects and tasks. A simple drag-and-drop tool allows you to set dates quickly and track time in the Timesheet. ProWorkflow has a mobile site version that is tested to be compatible with Android, iOS, and Blackberry smartphones and tablets. You can enjoy its standard features such as time tracking, task management, and the built-in messaging tool to download files and keep colleagues updated. ProWorkflow also integrates with Quickbooks and Xero, and you can add more productivity apps via its dedicated App Store. Download free add-ons for weekly workload, Chrome time tracker, customer map, recent messages, and profitability report. Its open API means developers can integrate their apps with ProWorkflow. Keep all project information in one organized page with the Project Dashboard. The app is easy to use with drag-and-drop functionality. You can control workflow and workload efficiently. Quickly create and delegate tasks with the user-friendly Bulk Task Editor. Create template for similarly structured future projects. Upload and share files the easy way by dragging and dropping files from your desktop. View and manage your workload in different ways to match your work process. Manage contacts more efficiently by enabling/disabling permissions, tagging, and personalizing data, and with Google Maps integration, group and update details, and more. You can choose from templates or customize your own reports. Create both quotes and invoices in one place. Get alerts from the built-in Notifications & Alerts. The vendor offers free online support and basic training. Worry-free security is provided by LayeredTech in Chicago, IL. You can access ProWorkflow via mobile site. Keep everyone in the loop with the Message Tool that keeps all your conversations in one place. Adjust the color scheme and logos to brand your own ProWorkflow documents. Keep track of most recent project activities and tasks with live alerts. You can utilize companywide overviews and interactive timelines to manage projects easily. Plan projects by taking into account staff availability and set realistic deadlines. Break down projects into easily doable task lists that have subtasks. Prioritize important tasks and recreate similar task lists using robust templates. Use the time tracking and budgeting tools to streamline your project and task processes. Create quotes and invoices based on budgeted time and actual time spent on projects and tasks. Forecast employee requirements and plan doable project scopes. Investigate how each individual employee’s workload is impacted in real time as the project progresses. Robust reporting tools help you to identify and measure metrics and make educated decisions to boost your business. Make use of the dedicated support offered to generate personalized custom reports that provide all the answers your company needs. Since each company has particular business wants, it is advisable for them to refrain from looking for a one-size-fits-all ideal software system. Needless to say, it would be useless to try to find such a platform even among market-leading software platforms. The clever thing to do would be to catalog the various vital aspects that require consideration such as required features, finances, skill levels of staff members, company size etc. Then, you should do your research thoroughly. Read some ProWorkflow reviews and investigate each of the other systems in your shortlist in detail. Such comprehensive homework can make sure you weed out ill-fitting applications and select the solution that provides all the aspects you require for business success. How Much Does ProWorkflow Cost? We realize that when you make a decision to buy Project Management Software it’s important not only to see how experts evaluate it in their reviews, but also to find out if the real people and companies that buy it are actually satisfied with the product. That’s why we’ve created our behavior-based Customer Satisfaction Algorithm™ that gathers customer reviews, comments and ProWorkflow reviews across a wide range of social media sites. The data is then presented in an easy to digest form showing how many people had positive and negative experience with ProWorkflow. With that information at hand you should be equipped to make an informed buying decision that you won’t regret. ProWorkflow is a MUST HAVE for businesses managing multiple projects, tasks, staff and budgets. What are ProWorkflow pricing details? What integrations are available for ProWorkflow? Pros: It empowers you to easily assign tasks and track time of each of the activity or project. You can also check the progress of the projects you undertake as it tracks time for each user. It helps you to communicate with your marketing teams and manage them with minimum effort. Regarding to billing, it increases visibility in account planning, budget and revenue forecast. Cons: It was difficult to load the software. It took long to get started with the application which was a drawback. As for refreshing, it portrays the same behavior as it is also slow. This happens when the variables are altered, and thus a limitation. Pros: It is able to customize all the work in the office making it easy to monitor every task without much effort. The interface is user-friendly and thus easy to get around and use it for our office work. 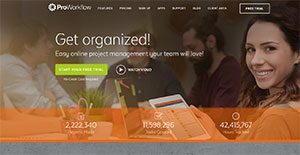 The ProWorkflow tool has become the cornerstone of our entire office projects and offers better support than any other software, of similar function, we have ever used. Cons: It is complicated when you want to generate reports. It offers a complex platform especially when you have a project with a long list of tasks. Following such a report can be tricky and confusing. It does not offer a feature to edit messages once you have entered them, instead, you have to delete and then enter them again. This can be annoying and tiring.